Thinking of a suitable gift for a nephew can be harder than it first appears. You might not see your nephew all that often and unlike a son, you probably don’t know him well enough to be able to think of a gift immediately. However, whatever the age of your nephew, there will be a gift out there he will love. So if you need some inspirational ideas, are a few present ideas for a nephew. Does Your Nephew have a Wish List? Most kids have a wish-list these days, often on Amazon or the like. Each time they see something they can’t live without they add it to their wish list and pray someone, somewhere, will take pity on them. 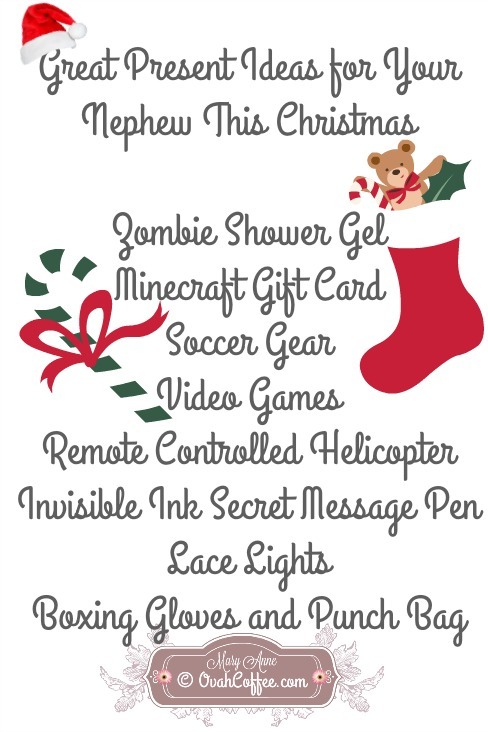 Before you go shopping, check whether your nephew has a wish list. If he does, you can check what’s on there and decide if any of the items match your budget. If they do then great, simply let his family know what you are buying and the job is done. If not, keep on reading. If you don’t have a big budget, or you need something extra as a stocking filler, zombie shower gel is a good buy. It is a disgusting green gunk in a bottle, which should entice even hygiene resistant kids into the shower. Most kids play on Minecraft, but if your nephew hasn’t yet discovered the delights of Minecraft, buy him a Minecraft gift card so he can check out a Minecraft server list to see which world he wants to play on. Once he is up and running on the world’s most popular game, he will have a whale of a time building and crafting blocks. Boys usually love soccer, so if your nephew is a huge soccer fan, the present buying process should be really easy. Find out what his favorite team is and invest in some team-branded kit. Alternatively, if he doesn’t support a particular team, buy him a new soccer ball or a new set of boots. Video games are always a good buy. There are literally hundreds to choose from, so always check which game your nephew actually wants, because he may already have many of the top ten games. And if he isn’t sure, buy him an Amazon gift card so he can choose his own game. Drones are for the big boys, but younger boys will have fun with a remote controlled helicopter. There are lots of different models to choose from, some more expensive than others, but look for helicopters with good reviews and easy to use controls. That way you or his parents won’t need to spend Christmas Day trying to fish a helicopter out of a tree. Your nephew will love sending secret messages to his friends thanks to an invisible ink pen. It’s a cheap gift, but a fun one nevertheless. He can write notes and then use the UV light to read them. This gift is great for playing spy games, or writing notes adults can’t read. Lace lights are a fun and inexpensive present for boys of all ages. They can use these to spruce up their favorite sneakers and wow their friends in the schoolyard. It is good for kids to develop some self-defense skills and boxing is a fun sport to try. Boys who learn to box are more self-confident in the schoolyard, so why not get your nephew off to a good start by encouraging him to take up boxing? If he enjoys it he can join a boxing club and develop his skills further. Do be careful not to buy a gift that is completely unsuitable for the age of the child. This is especially important if the gift has any small parts, as they could represent a choking hazard for smaller kids. Age appropriate is also important when it comes to video games. All games have an age rating on them, which will help you make a sensible decision, but use your common sense when buying to make sure you don’t end up giving him a violent game – he might love it but his parents probably won’t be very amused. Gift buying is not always easy, especially if you have to post the item. Always check the cost of postage before you buy, or you might end up paying a small fortune to post an inexpensive item.